NOTES : An English language version was also released. Manual on the inlay, in French, English and German. 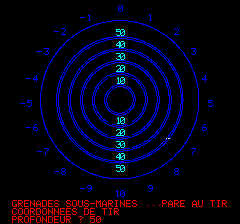 Franchement, ce jeu était vraiment un chef d'oeuvre sur Oric:superbes graphismes, sons très réalistes et éléments de simulation sophistiqués (les systèmes de visée en particulier) qui procuraient un sentiment d'immersion inégalé. J'y ai passé des heures et pris beaucoup de plaisir, ce jeu reste pour moi l'un des tous meilleurs jamais réalisés! 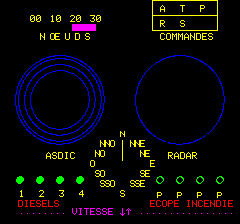 HeÃ¯ Captain, go to red Alert An excellent simulateur, the sounds are so real et the continuing alarm create a stressful atmosphere. I love the Sonar panel, so well animated &the sounds are very realistic, you chose direction to launch grenades but torpedoes are on you, at last The radar panel is full of dots, where is the carrier, a complete fleet is facing you, don't lose time, captain ! 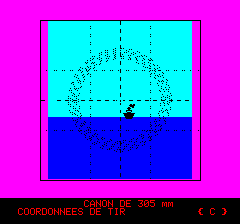 This is THE simulation game for oric! 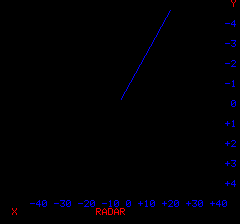 Keep an eye on the sonar and the radar, while resisting the assaults and managing the temperature of the engine! The ancestor of silent hunter on amiga then carrier command on amiga which led to hostile waters on pc! I concure on what Lothlin wrote. A better game than Frigate Commander by IJK, with a lot of action to prove you in. The aircraft is nice made and can be hard to hit. Overall - a good game. Though I haven't found the convoy yet !!!!!! 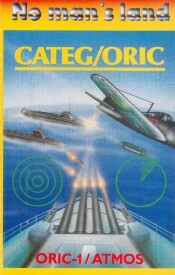 Categ-Oric (that is what the English version is called), was a game I played a lot when I was younger. 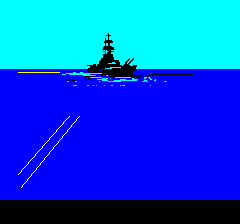 It is a good simulation of naval warfare (better than Frigate Commander by IJK) set in World War II. 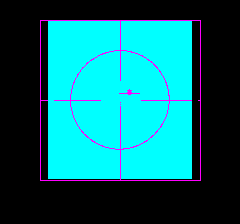 The graphics are fairly basic, but extremely clear and do a good job of helping you in your task. The sound is also limited, but good - the sound of the ASDIC equipment and the blaring alarm klaxon for example. When the action hots up, the klaxon sounds all the time, driving you nuts! 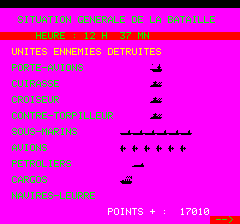 The game involves you in a battle against submarines, surface ships and aircraft - there is also a convoy you can pick off for extra points if you are quick. Your ship is armed with a cannon (against ships), machine guns (against aircraft) and depth charges (for the subs). A really good game for simulation/Trek-style fans, but not one for the arcade blasters among you!